South of France, where the Rhône flows into the sea, is an almost desert country called Camargue, where still live wild horse herds. The Ile de Camargue is a vast plain, enclosed by the two arms of the Rhone and the Mediterranean Sea. Between the Petite Camargue to the west and east Crau, no point of the delta reached over 4.50 m.
The ceaseless fight of the Rhône and the sea, conjugated to the action of the man constituted during ages a mosaic of circles and landscapes of an exceptional wealth. To the north, the man made his mark by developing agricultural activities. The construction of the dam to the sea in 1859 helped contain saltwater lifts. Finally, containment Rhone 10 years later, limited the Rhone floods that flooded regularly arable land. Gradually, grain fields, asparagus, vineyards and intensive rice were substituted for the Camargue primitive landscapes. 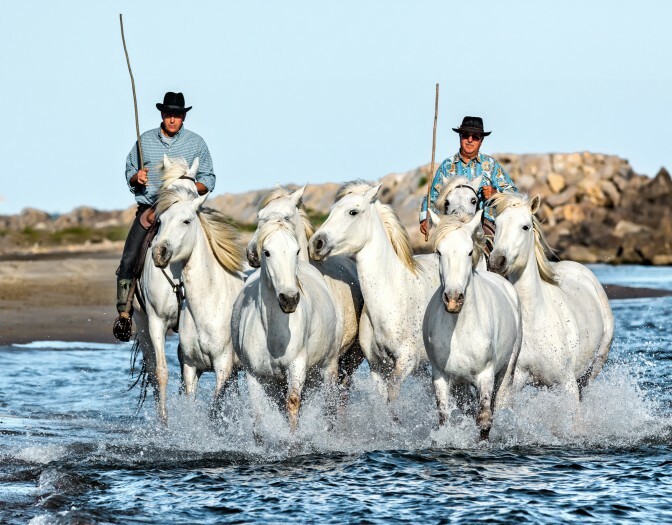 For an exclusive travel in Camargue and discover an authentic Camargue bulls guardian, go further south. The sansouire, ponds and marshes dominate the landscape, although they gradually regress against the expansion of agricultural areas, salt producers, urban and tourist. The protection of this natural area yet determines the diversity and ecological balance of the fauna and flora of the Camargue and the existence of natural pastures essential to maintaining the traditional breeding bull and horse Camargue. the Camargue is a true animal paradise, especially for birds. More than 300 species have been recorded there. The Camargue is a major migratory bird relay in Europe.